April jobs report: Have we reached full employment??!! April showers–it’s pouring in DC today (are the skies crying after the health care vote? )–brought job-market flowers, in the form of another solid jobs report. I’ll get to the topline numbers in a sec, but this note is going to be about the fundamental, Talmudic question: is the US job market at full employment? Payrolls were up 211,000, well above March’s downward revision of 79K. Such jumpiness invokes the need for JB’s patented jobs smoother. 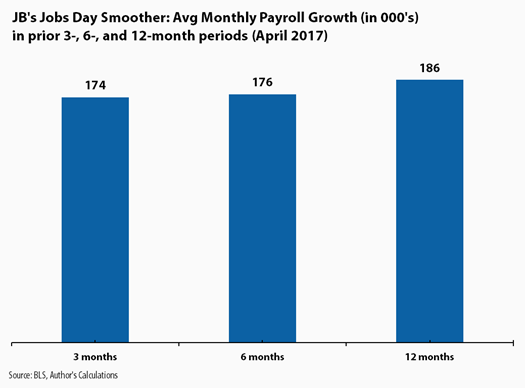 It shows average monthly job growth in a very healthy 175-185 range in recent months, which is fast enough to pressure the unemployment and underemployment rates down. The overall jobless rate, at 4.4%, is the lowest since May 2007; the underemployment rate, at 8.6%, is about at the level I consider to be consistent with full employment. Long-term unemployment–which was very highly elevated throughout earlier years of this recovery–is back down to about 1 percent of the labor force; that’s the lowest since May 2008 and almost back to its pre-recessionary low point. The number of involuntary part-timers–the group that, along with the unemployed, drives the underemployment rate–is down almost 4 million from its peak (it was 9.2 million in September of 2010 and was 5.3 million in April). Participation rates remain low relative to pre-recession levels, but part of that is our aging demographics. The prime-age (25-54) employment rate rate ticked up from 78.5% to 78.6%; it has now recovered 69% of the ground it lost during the recession. The prime-age employment rate for men, at 85.4% is two-thirds of the way back to its pre-recession peak, while the rate for women, at 71.9%, is 78% back to its January 2007 level. Yes and no. Sorry, but there’s a key factor missing from the full employment picture: price pressures. I mean, they’re not completely absent, but neither are they obviously in the data. Let me explain. I’m not just being a grouch about this–I’m very bullish on our labor market progress (some of it is due to low productivity growth, but let’s not go there right now). But the truth is–trust me on this–no economist knows, outside of a very wide confidence interval, what the natural rate is right now. It could be percentage points below today’s 4.4%. We basically derive the full employment jobless rate by looking at correlations between unemployment and inflation (the “Phillips curve”). But, as the figure below suggests, that correlation has been very flat in recent years. Unemployment has indeed fallen to levels consistent with the Federal Reserve’s version of full employment, and wage growth has accelerated a bit. It was around 2%; it’s now about 2.5%.But inflation—I’m using the PCE core—hasn’t picked up much at all and remains below the Fed’s target rate of 2%, where it has been for years now. The next figure plots various inflation measures. You can certainly see clear price acceleration in the overall CPI, but that includes energy prices, which have normalized in recent months, so that’s not a “natural rate”/labor market story. If you look at most inflation gauges, including the Cleveland Fed’s trimmed mean and median CPIs, you see a bit of upward drift, as you’d expect in year eight of an economic expansion wherein inflation has heretofore been uniquely low. But until inflation starts clearly accelerating, it is not correct to assume that labor market pressures are forcing utilization constraints and leading to threatening price pressures. 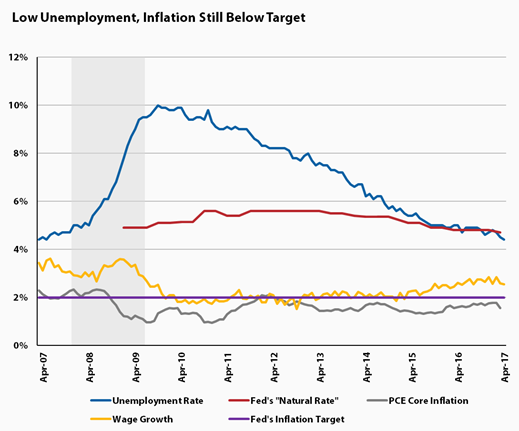 Why isn’t inflation responding more to the tightening labor market? A) inflation expectations are extremely “well-anchored,” b) the tight labor market is delivering some wage growth but not a ton (see figures below), suggesting that worker bargaining power still remains constrained, c) though it has come down off of its recent peak, the dollar remains pretty strong, and, probably most importantly, d) wage growth isn’t bleeding into price growth. 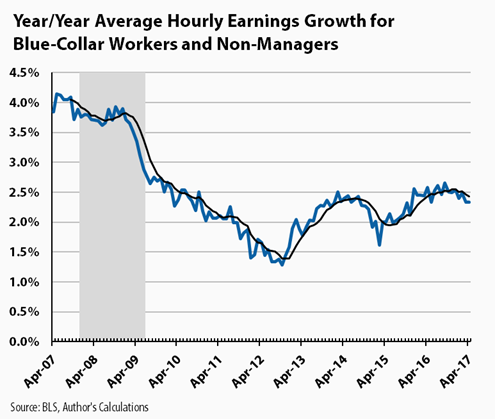 Re point “b”, the next two figures show year/year average hourly wage growth for all workers and for blue-collar, non-managerial workers, along with 6-month moving averages. They show some recent acceleration, but most recently, they’ve held steady at around 2.5%. 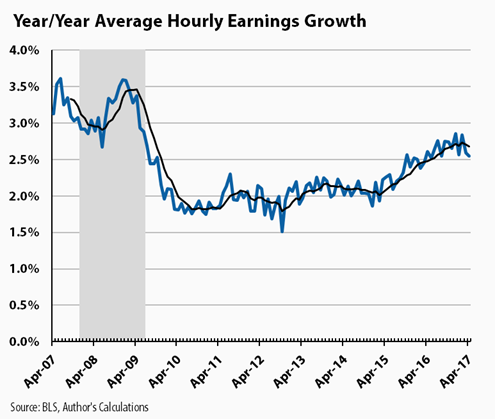 So hard to see a great deal of wage pressure, which may be another reason for the wage growth/price growth disconnect. So, I welcome another in a series of solid jobs reports. But at least by one fundamental metric–the pace of inflation–the evidence for being at full employment remains incomplete. Share the post "April jobs report: Have we reached full employment??!!" 5 comments in reply to "April jobs report: Have we reached full employment??!!" Could the increased employment for 55+ somehow drag down worker bargaining power while increasing number of employed? However, 55-64 is 0.5% away from Jan 2008, and 65+ have increased employment since June 2008. I’m not sure what this means in terms of full employment, but it seems like an interesting divergence in the employment-population ratios for each cohort. So, Aaron’s analysis suggests that 55+ workers are depressing earnings for the 25-54 as a fight for the available meat on the economic carcass, but a truer measure is when the less-skilled younger workers are invited because there is no one else left? I am empathetic to this on some level. In a low inflation era firms tend to raise prices once a year–usually at the start of their calendar or fiscal year. As a consequence about half of the annual increase in the core CPI occurs in the first quarter. Simply doubling the first quarter NSA core CPI provides an amazingly accurate projection of the December to December change in the core CPI. 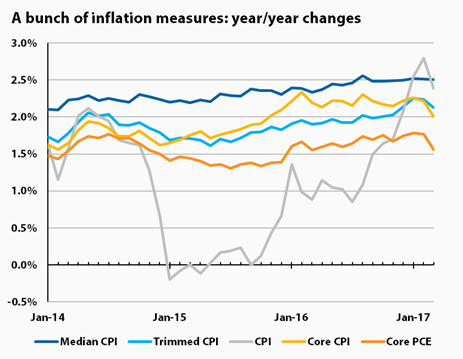 Right now it projects that the core CPI will increase less in 2017 than it did in both 2015 and 2016. With oil and commodity prices apparently peaking and the core CPI less than in the last 2 years you probably should revise your inflation expectation down to below 2%. Oddly and surprisingly and suspiciously U6 fell a full percent or a million people in about three months. (Per BLS numbers) Job growth can not account for this drop. The Times reports today prime age labor force participation continues to climb, though still two million short of pre recession levels (2% of 250 million give or take) and 180,000 non prime dropped out last month. Also, in the interest of staying factville, please label wage gains nominal (without inflation) vs real (after subtracting 2% inflation rate). Workers are actually getting 1/2 percent raise, not 2 1/2. As this pertains to Fed policy, wage-push inflation isn’t currently an issue. Even if wage earners begin to regain a little lost ground, the Fed has potent tools to deal with any resulting inflation. The Fed is better advised to let inflation run a bit, as long as wages are gaining more than prices.